The town of Ritter Oregon was built around McDuffee Hot Springs, later to be renamed to Ritter Hot Springs. 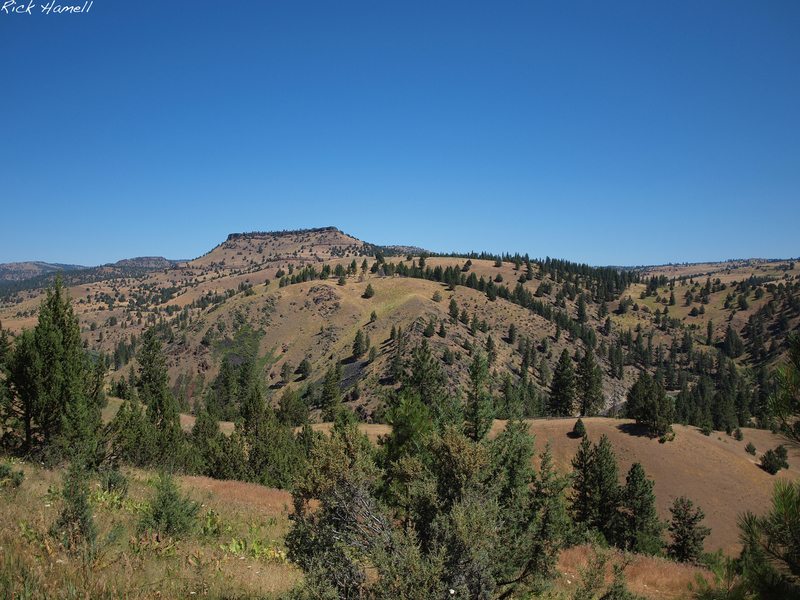 “William Neal McDuffee, an early packer between Umatilla and the John Day Valley mines, discovered the hot springs, named for him, on the Middle Fork of the John Day River. He homesteaded up on the flats southeast of the spring. Rube McGilchrist homesteaded the hot springs land. The Rev. Joseph Ritter, a pioneer Baptist minister, contributed his name and room in his homestead house for the post office established in 1886. After Ritter Post Office was moved to the Powell Ranch, then to the store at McDuffee Hot Springs, the resort became known as Ritter Hot Springs. The Charles Davis family bought Rube McGilchrist’s ranch and resort in 1896 and began their 56 years of operating Ritter Hot Springs. The store building, which still stands, was built in 1894, and J.D. Kirk owned it in 1896. It changed hands several times before the Davis family bought it several years later. Mr. Lige Davis ran the store and post office for 12 years. After he and Josephine Jackson were married, they lived at the store until they moved to their ranch. A cabin built over the spring enabled people seeking cures to bathe and soak in it during any weather. A bathhouse with three wooden tubs was built in the early 1900’s. Troughs carried the 110 degree water from the spring to the tubs. The original log hotel and home burned in the winter of 1903. The fire was caused by a hot, pitchy flame overheating the stovepipe. Mildred Davis was a baby, Lige was 3 and James was 5 years old. Everything burned so quickly, the children were without clothes and shoes to put on the next morning. The ranch house from the Powell place one mile up the river was moved to the resort and used for a home and hotel during the several years the new larger building was under construction. William and Paul Gruppe rode horseback from the Gruppe ranch to work on it. After the hotel was completed, the dance hall building was started. Mail was delivered to Ritter Post Office by horseback from Ukiah and Long Creek for a time. During some years Phil Fairbanks operated a stage line to transport people, mail and freight. The stage was an open buckboard, so determination to travel had to be pretty strong. Meals were served and horses changed at stage stations between Ukiah and Long Creek, but there were no stop-overs. Later freight was hauled to the Ritter Store from Heppner and Pilot Rock. A tragedy occured on the first swinging bridge, built without railings, across the John Day River between the hot spring and the rest of the resort. Early in the 1900’s two Wilmoth boys were sent on horseback from their ranch to get the mail, with instructions not to cross the river but to call to an adult to bring their mail over to them. However, the older brother told the younger youth to stay on the east side with the horse while he went to the post office. The younger boy followed him, however, and fell into the river. When his brother tried to resuce him, they both drowned. To reach Ritter required courageous determination to brave the old road that followed the backbone of the hill and ended with the dramatic climax of a steep 5-mile downgrade. The road was narrow and places to pass were rare. A few cars did roll over on the road, but there were no serious injuries. In spite of the challenge of reaching Ritter, people went for a day, for days or for weeks. They stayed in the hotel, or the cabins, or camped in their own tents. Many from Baker, Heppner and even Portland returned year after year for vacations and cures. The resort was open all year. Most of the winter guests came for their health. Victims of all types of rheumatism, skin disease, stomach trouble and other ailments sought relief from their afflications. Some of the imflammatory rheumatism cases came in on stretchers. The grayish green moss that grew in the moss farm in the mineral water helped skin infections when bandaged to the sores. People dried the moss and took it home for further treatment. Stomach patients drank the water. One of them was so miserable he could hardly eat. He was restored to such good health by Ritter Hot Springs treatment that he even enjoyed eating spare ribs with the other diners by the end of his stay. The guests soaked, rested and visited most of the time, enjoying the friendly atmosphere and good food. They also played cards and horseshoes. There was a large stable and a pasture on the hill for the guests’ horses. Fifty head of their horses were in the pasture at times. Women from the area were hired to cook. Mrs. Elsie Mulkey, Mrs. Davis and others are remembered as especially talented cooks. The hotel meals were served family style. The Davis’s cows, chickens, and pigs produced meat, eggs and dairy products. A large garden and an orchard irrigated with the warm mineral water grew luxuriantly, providing fruit and vegetables. The good fried chicken dinners on Sunday were a specialty. The terrible Heppner flood was June 14, 1903. The phone line nailed to the fence posts enabled Heppner people at the resort to phone for information about their relatives and homes. A light plant provided electricity for some years before the electric line reached Ritter. Dances were fairly frequent. At times a dance was held about every two weeks at the resort or in one of the larger houses in the area. The piano in the Ritter Dance Hall was accompanied by a violin, banjo, or guitar. Some homes had an organ. Sometimes 200 people attended dances at the resort after cars made transportation easier. Dancers from Monument and Heppner joined the guests and community people. The crowds were often too large for everyone to dance at once in the hall so the extra people were out about the grounds. Charles Davis died in 1920. Mrs. Davis and the family continued to operate the resort. Mrs. Davis was a strong cheerful woman who was up early to work long hours until she was past 80. She liked people and visiting and often paused with her broom in hand to have a lengthy conversation with a guest. Every minute of every able-bodied relative or friend was needed to care for the guests. “Come over and help, we are swamped with a crowd” was a frequent message from Mrs. Davis to relatives, friends, and her daughter-in-law Mrs. Lige Davis. The Davises decided to build a swimming pool but feared the added noise would annoy the sick guests. 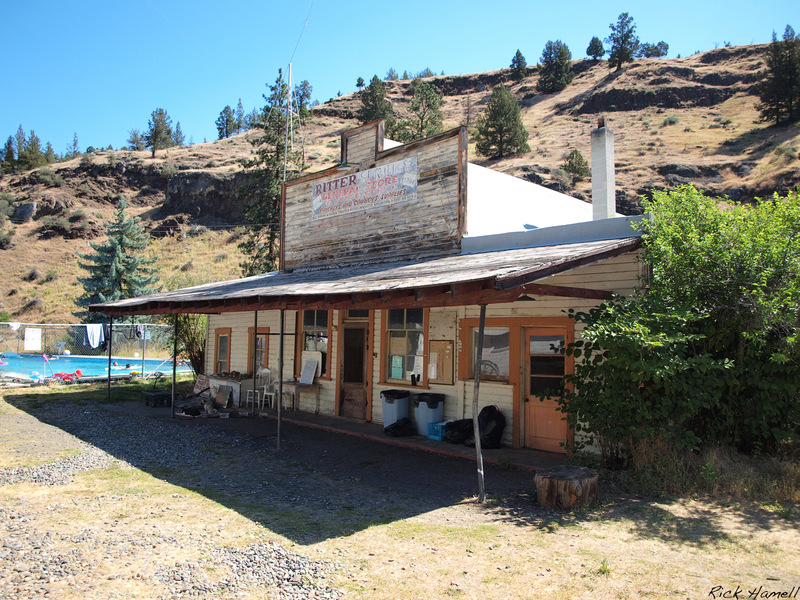 So a cement pool and dressing rooms were built at the upper hot springs, one mile up the river on the old Powell Place. During the day they tried to keep someone at the pool to collect the half dollars and quarters. Frequently crowds at the resort demanded everyone’s attention, so swimming would be free. Considerable revenue was lost by not having anyone on duty to collect fees for the night swimming parties. Some of them were famous celebrations, especially during prohibition days. The second hotel burned in 1951. There was no firefighting equipment available, but fortunately neither was there any wind, so the flames went straight up in the air. It seems like a miracle that only the hotel was lost. In 1956 Mr. and Mrs. R.R. Gray bought the resort from Mrs. Davis. Mrs. Davis moved to Pendleton and lived there until her death at the age of 93 in 1966. Since 1956 more ground has been leveled at the resort. The two-story dance hall was moved to make room to build a new swimming pool. 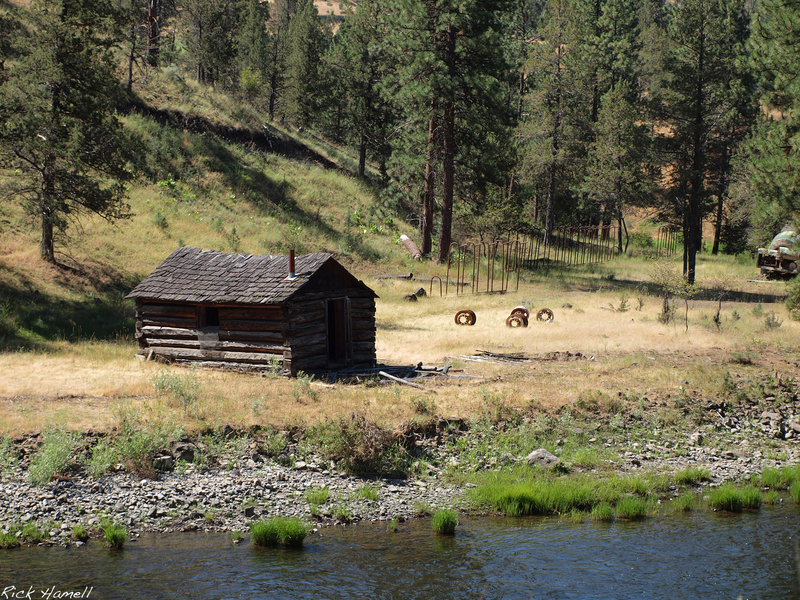 This is a little cabin across the river from the Hot Springs. 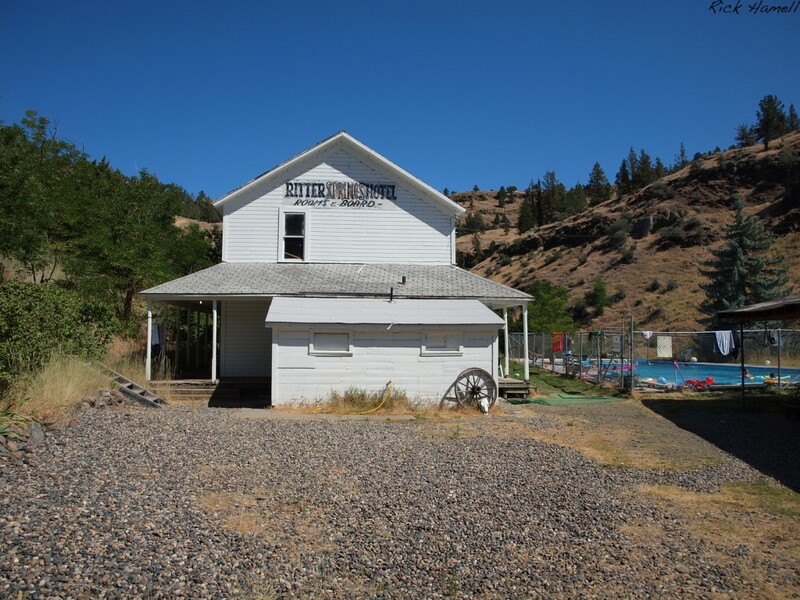 <img src="http://PNWPhotoBlog.com/wp-content/uploads/sites/11/2011/07/Eastern-Oregon-Valley-1024×768.jpg" alt="Ritter Hot Springs, Ritter Oregon (Ghost Town)" title="Eastern Oregon Valley" width="1024" height="768" class="aligncenter size-large wp-image-1057" This is on the other side of the valley. The town of Ritter is to the left and behind that second hill. There are some additional historic photos on the Ritter Hot Springs Webpage. I am related to Ritters,and Powells .Would like to know more about the families. My parents and I moved into the Ritter area at the beginning of WWII. our place was on Three Mile Creek. The Three Mile School was just a quarter of a mile from our house. My stepdads name was Pierson.